This reporting period covers four weeks of Venus Express operations, including tests with ESA's new ground station at Malargüe, the end of the thirteenth occultation season and the start of the twenty-second solar eclipse season. All Cebreros (CEB) ground station activities were nominal during this reporting period. The spacecraft systems, payload and ground stations showed excellent performance. Regular maintenance of the ground station was scheduled on 9 and 10 October. Such maintenance activities and regular data downlinks from the spacecraft are carried out during the day in order to minimise operational costs. This means that the ground station is unavailable for part of the work day (from 10:00 to 15:00 local time) while maintenance activities are carried out. Thus, the time available for data downlinks from the spacecraft is reduced on days when ground station maintenance is performed. The spacecraft's telemetry bit rate was switched to 182 kbps beginning 17 September; the primary high gain antenna (HGA-1) was in use. The bit rate was again decreased to 152 kbps before a pass with the Cebreros ground station on 4 October. 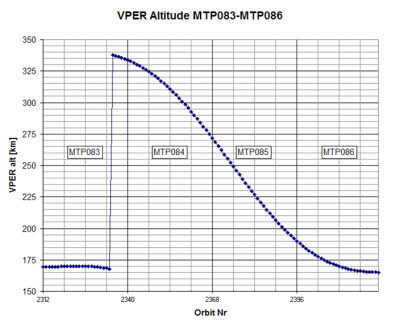 The bit rates are regularly changed as the spacecraft distance from Earth changes, in order to have the maximum downlink bit rate while also maintaining a useful downlink signal. The Malargüe station, Deep Space Antenna 3 (MLG, DSA-3), is ESA's newest tracking station. It is located 30 km south of the city of Malargüe, about 1200 km west of Buenos Aires, Argentina. DSA-3 hosts a 35 m-diameter antenna with transmission and reception in the X-band and reception in the Ka-band. The antenna will enter full service in January 2013, providing daily support to missions such as Venus Express. To prepare for the start of routine operations, numerous tests were performed on the station and the interfaces between the station and other sites. These tests ensure that Venus Express telecommands can be uplinked from the station, and that the station can receive Venus Express telemetry and transmit it to the European Space Operations Centre (ESOC) in Darmstadt, Germany. These tests were performed on 17, 18 and 19 September. As the science data transfer to the ground station was completed early on 24 and 26 September, the operations team also used the extra time on those days to test Malargüe communications with Venus Express. All tests were completed successfully. All New Norcia (NNO) ground station activities were nominal. The ground station was used for occultation observations from 18 September to 6 October; of these, the observations on 30 September and 2, 4 and 6 October were obtained at orbit pericentre. The Malargüe and Cebreros ground stations were used for a Delta Differential One-way Ranging (delta-DOR, or DDOR) measurement on 16 September. These measurements are carried out with the Venus Express spacecraft on a regular basis to support the accurate determination of the ephemeris for the planet Venus that is maintained by NASA's Solar System Dynamics Group. For more information about DDOR, see the "Delta-DOR measurements" link in the right-hand menu. Venus Express's twenty-second eclipse season started on 19 September. During eclipse seasons, as viewed from the spacecraft, Venus occults the Sun for part of each orbit. Eclipse ingress and egress observations were made with the Solar Occultation at Infrared (SOIR) channel of the Spectroscopy for Investigation of Characteristics of the Atmosphere of Venus (SPICAV) spectrometer. The SOIR channel is specially designed to measure atmospheric absorption by observing the Sun through the Venusian atmosphere. SOIR solar occultation observations can only be taken during the eclipse seasons, so for this reason they have a very high scientific priority in those periods. During this reporting period, SOIR ingress or egress observations were taken in roughly half the orbits. Most of these were ingress-only observations, and were followed by the taking of low resolution VMC images of the surface. For further information, please see 'Science observations with Venus Express during an eclipse' – linked from the right-hand menu. The mission's longest Earth occultation season continued during this period and ended on 6 October; science observations were carried out in 11 orbits, from 18 September to 6 October via ESA's New Norcia ground station. The occultations occurred before the pericentre, in the ascending branch of the orbit. Therefore, the occultation measurements were often taken in alternate orbits to the SOIR measurements and surface imaging that were carried out for the eclipse season. For more information on occultation observations, see the link in the right-hand menu. In preparation for the start (on 19 September) of the twenty-second eclipse season, the battery end of charge state was raised to 100% (25.2 V) on 17 September, where it will remain until the end of the eclipse season on 19 November 2012. During solar eclipse seasons, the spacecraft is in complete darkness during a portion of each orbit when Venus blocks out the Sun. At this time, the spacecraft bus and payload are powered by the on-board battery, which must then be recharged to 100% prior to the next eclipse. The battery (composed of three individual battery packs) is sized so that at the end of its life, the spacecraft can go through the longest eclipse and still retain enough stored power for the spacecraft to successfully complete a transition to 'safe mode' in the event of a spacecraft system anomaly. Outside eclipse seasons, sufficient battery power must be maintained at all times for a transition to safe mode. However, a lower than 100% battery energy level (or end-of-charge state) can be maintained at those times, as no provision is needed for eclipses. Lowering the battery's end-of-charge state prolongs its life. The clock on the Venus Express spacecraft is a simple count-up timer, typical of those used on spacecraft. These clocks save weight and cost but they tend to drift, and must be synchronized – or correlated – with atomic clocks on Earth at regular intervals. One of these regular time correlations was performed on 27 September. No orbit control manoeuvres were scheduled during this 28-day planning period. At the end of the reporting period on 13 October, Venus Express was 107.8 million kilometres from Earth. The one-way signal travel time was 570 seconds. The final oxidizer mass was 23.771 kg and the final fuel mass was 14.695 kg. This reporting period falls under medium term plan (MTP) #84, which covers the period 16 September to 13 October 2012. A long Earth occultation season, the mission's longest, ended during this period, on 6 October. The twenty-second eclipse (solar occultation) season started on 19 September, providing a long period with simultaneous Earth and solar occultations. During eclipse seasons, as viewed from the spacecraft, Venus occults the Sun for part of each orbit. Eclipse ingress and egress observations were performed during this reporting period with the SOIR channel of the SPICAV instrument. The SOIR channel is specially designed to observe the Sun through the Venusian atmosphere to measure atmospheric absorption. SOIR solar occultation observations can only be obtained during the eclipse seasons, making them a scientific priority in these periods. In this reporting period, ingress or egress observations were acquired in roughly half the orbits using the SOIR channel of SPICAV. Most of these were ingress-only observations, and were followed by low resolution imaging of the surface using the Venus Monitoring Camera (VMC). 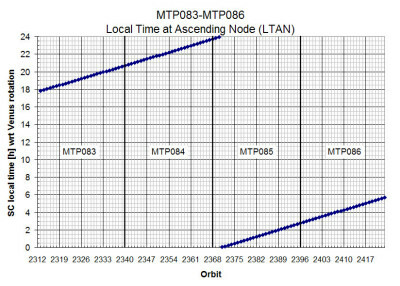 The local time at ascending node (LTAN) changed from 20:40h to 23:40h. This meant that the season was 'cold', so that pointing the +Z instrument face of the spacecraft at nadir did not expose any thermally sensitive faces of the spacecraft to the Sun. Venus Express flew over Maxwell Montes (65.2°N, 3.3°E) between 26 September and 6 October (orbits 2350 to 2360). Nadir observations using the SOIR channel of SPICAV and surface images using the Venus Monitoring Camera (VMC) were a top priority during this period. To enable a greater number of eclipse observations, some Earth occultation measurements using the Venus Radio Science instrument (VeRa) were skipped. Other surface targets included Sif Mons (21°N, 8°W) and Gula Mons (22°S, 1°W) in Western Eistla Regio, which may cover an active section of the Venus mantle. In the southern hemisphere, an important target is Innini Mons (34.7°S, 31.7°W) in Dione Regio, which has been identified as a recently active volcano. It has been estimated that the flows are possibly as geologically recent as 2.5 million years. The Dione Regio region was targeted by the visible channel of the Visible and Infrared Thermal Imaging Spectrometer (VIRTIS) early in this planning period. MAG The instrument was regularly operated nominally as part of the routine plan. PFS The instrument was not operated. VIRTIS The instrument was regularly operated nominally as part of the routine plan.